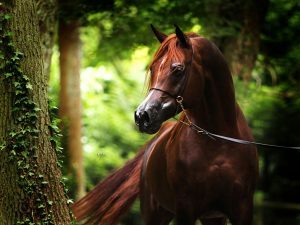 Australia has its fair share of famous horses, which include the very impressive Arabian breed. It is most interesting to look back at the history of these horses that have become famous throughout the years. Many would think that if one were going to invest in a horse, it would be because the horse has some claim to fame. This may not always be the case, but when it comes to race horses, they are in big demand. It has been indicated that some are willing to pay up to $2.4 million for a horse on the racing circuit. The Arabian horse breed is one that is well respected in Australia for many different reasons. Yet historically, the presence of the Arabian breed only dates back two hundred years. This is when it is believed that some Arabian horses were among the breeds that were brought into the country from the First Fleet in 1788. Eventually, there were in excess of one hundred stallions listed in the Australian Stud Book under the category of Thoroughbred Bloodhorses. When it comes to famous Australian Arabian horses, one needs to go back to 1806, when Hector was imported. Hector made his presence known as being an exceptional sire in the first decade racing circuit. Although Hector was the Arabian that stood out in the crowd, there were others that fell into the category of being impressive, which included White William, Model and Saladin. The Arabian horses were often referred to as “bloodhorses”. It’s important to know that although Old Hector was fairly recognised, there were many others that were not included in the recordings of studs, that were of equally fine stock. When the time arrived where horses were being properly recorded, it started with those who came from the Crabbet Stud. The first imported stallion was Rafyk, who arrived in 1891. Following this, many stallions, as well as mares, were imported. Currently, the oldest Arabian line to exist is the Dahna’s line. It turned out that about 40% of those entered in the first volume of the Australasian Arab Horse Stud records were descendants of Shahzada. The importation of fine Arabians was continued by Mrs. A.D.D. Maclean, who kept the horses at the Fenwick property. The importations were those from the Crabbet Stud, with the exception of two. As time progressed, the breeding of Arabians continued in Australia, which has led to some exceptional foals being put on the ground. As a result of fine breeding and importation, the foundations have been laid for many well know racing events in Australia, along with some impressive championship events, such as the Australian Arabian Championships that are held each year. Thanks to this amazing breed of horse, they bring racing joy to the world of entertainment through many different venues. Many of which can be enjoyed online.